I watched this movie on TCM, it is loaded with real travel situations. 1. Children following around a foreigner. 2. The foreigners selling paintings. 3. The foreigners going to another country to learn art. 4. A woman trying to sweeten the pie, by buying his paintings. Many times women with money adopt men with no money. 5. And going to Paris is extreme cliche, and will continue to happen forever. 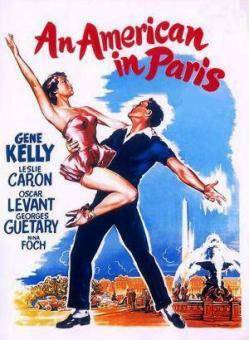 An American in Paris is a 1951 MGM musical film inspired by the 1928 orchestral composition by George Gershwin. Starring Gene Kelly, Leslie Caron, Oscar Levant, Georges Guetary, and Nina Foch, the film is set in Paris, and was directed by Vincente Minnelli from a script by Alan Jay Lerner. The music is by George Gershwin, with lyrics by his brother Ira, with additional music by Saul Chaplin, the music director. The story of the film is interspersed with dance numbers choreographed by Gene Kelly and set to Gershwin's music. Songs and music include "I Got Rhythm", "I'll Build A Stairway to Paradise", " 'S Wonderful", and "Our Love is Here to Stay". The climax of the film is "The American in Paris" ballet, a 16 minute dance featuring Kelly and Caron set to Gershwin's An American in Paris. The ballet alone cost more than $500,000.